This Sunday we remain in the afterglow of Epiphany, the celebration of the “manifestation” of Jesus’ divine glory. [Greek epi – phaino = “shine upon” = “reveal, manifest.”] Epiphany, which once was its own season (like Advent or Christmas), has often been associated with three events from the Gospels: the Magi, the Baptism, and the Wedding at Cana. These are the first events that reveal or “manifest” Jesus’ glory in the Gospels of Matthew, Mark, and John, respectively. Certain well-known Epiphany hymns (e.g. “Songs of Thankfulness and Praise”) make reference to all three events, and in antiquity the celebration of all three was clustered around January 6 in many rites. Eventually, the different rites separated out the liturgical celebration of the different events and placed them on separate days. In Year C, the Church quite consciously offers us the Wedding at Cana for our meditation on the Sunday immediately following the Baptism. By happy Providence, this year we are able to ponder the Magi, the Baptism, and Cana on successive Sundays. The Readings for this Lord’s Day highlight Jesus as our spiritual bridegroom. The prophet speaks to the people of Israel while they are in exile, and promises that in the not-to-distant future, the LORD will renew his affection for them, and take them back into a covenant relationship with Himself. The heavy use of marriage metaphors in this passage stems from the fact that marriage was a covenant in Israelite culture, and thus a good image of the covenant relationship between the LORD and Israel. The prophet refers to the people of God as “Zion” and “Jerusalem,” using the capital city as a personification of the nation as a whole. She is also personified as a woman, sometimes elsewhere called “daughter Zion” or “virgin daughter of Zion.” In previous posts we have commented on the Marian sense of this personification. Mary, the virgin daughter of the House of David whose royal compound was on the hill of Zion, is a personal realization of this “lady Zion” the prophet speaks of. Our Mass translation says, “As a young man marries a virgin, your Builder shall marry you,” but many other English translations, as well as the Vulgate and the Septuagint, read, “As a young man marries a virgin, your sons shall marry you.” This is because the Hebrew consonants for “your builder” and “your sons” are the same (b-n-y-k), so it cannot be determined which meaning the ancient prophet had in mind. Both are theologically suggestive. “Your Builder shall marry you,” suggests that God, the builder of Jerusalem, shall renew his loving relationship with his people and enter into a new covenant with them. Alternately, it was the Davidic kings, starting with David and Solomon, who built up Jerusalem, so it may suggest a return of the Son of David to renew his covenant of kingship with the people (compare 2 Sam 5:1-3). Finally, “Your builder shall marry you,” recalls the creation of Eve by God, since Eve was literally “built” (b-n-h) out of Adam’s rib (Gen 2:22). “Lady Jerusalem” here is a kind of New Eve, a new sanctuary-bride. On the other hand, the translation “Your sons shall marry you” suggests that the young men of Israel shall renew their loyalty to their people and their Holy City, Jerusalem, and commit themselves and all their youthful strength for her upbuilding and welfare. All the different senses of “builder” or “sons” have a certain resonance with the Gospel reading. The Church has rightly seen in the Wedding at Cana a certain public revealing of the New Adam (Christ) and the New Eve (Mary). Mary is a type, icon, and embodiment of the Church—what is true of her personally tends to be true of the Church corporately. In Mary we see one whose “builder” has espoused her, because the Creator Spirit is also her Mystical Spouse. Though Eve was not espoused by her “builder,” Mary is. Likewise, though Jesus is her son, Mary as the first Christian and icon of the Church also knows her son as her spiritual Bridegroom (Eph 5:21-33). This is also true of the Church: the Church gives birth to Christ in the world through the administration of the sacraments, especially Baptism. So the Church is mother of the “little Christs”, that is, Christians. Yet the Church also knows Christ as her Spouse. In keeping with the “Epiphany” or “manifestation” theme, the Church turns our thoughts in this Reading from how Jesus’ divine glory was manifested (Magi, Baptism, Cana) to how the glory of God is manifested in the mystical body of Christ, which is the Church. The glory of the LORD continues to be revealed in us. “To each individual the manifestation of the Spirit is given for some benefit.” The different “spiritual gifts,” “forms of service,” and “workings” distributed among all Christians show that God is still at work among us. Unfortunately, in most local parishes, the spiritual gifts of many believers lie dormant, because they have had little or no encouragement or training in how to identify the gifts they have receive from the Spirit and how to employ them in the building up of the body of Christ. Instead, we have a “professionalized” view of church work in which the pastor, assisted by paid staff or some religious, do all the spiritual service. This text from St. Paul challenges us all, both clerics and laity, to rethink how we organize our parishes, and to make an examination of conscience as to whether (1) we fully recognize that every believer has a “manifestation of the Spirit” for the service of the Church and (2) if we are offering any practical means by which the lay faithful are helped to recognize, develop, and employ these spiritual gifts. There is far more theological and Scriptural symbolism going on in this passage than I can adequately discuss here. For example, the six stone jars filled with water are representative of the Old or Mosaic Covenant. St. John even links them explicitly to this covenant by mentioning they were “for Jewish ceremonial washings,” i.e. for the rituals necessary to fulfill the principles of ritual purity spelled out in Leviticus and Numbers. It was difficult to make jars out of stone—much more difficult than to make them out of clay. The stone had to be turned on a lathe, and a very large one at that in order to make a jar capable of holding 20-30 gallons. There had to be a great deal of motivation to make jars out of such a cumbersome material to work with, and the motivation was ritual cleanliness—according to the law of Moses, stone could be cleaned and did not transmit uncleanliness, whereas clay contracted uncleanliness permanently and had to be broken up once it was rendered unclean. So stoneware was hard to make, but did not need to be discarded when rendered unclean. Thus, it made a perfect material for holding water used in ritual cleansing, because this water could become unclean and render its container unclean—but the stone could be cleansed and used again, whereas a clay pot would have to be broken up. We have found many stone vessels at Qumran, the site of the Dead Sea Scrolls, but mostly small ones, nothing on the scale of these very large jars. The household that was hosting this wedding was both wealthy and devout—wealthy to be able to afford such large stone jars, and devout inasmuch as they spent the money necessary to make ritual cleanliness possible in the household. There are six of them, and six is almost always a symbol of limitation or defect in the Old Testament, a failure to reach seven, the number of covenant and perfection. Furthermore, the jars are “stone,” reminding us of the covenant written on stone rather than upon the human heart (2 Cor 3:3; cf. Ezek 26:26). They are filled with “water,” like Moses provided in the desert (Exod 17:6): water keeps you alive, but brings no joy. Wine brings joy: Zech 10:7, Ps 104:15. 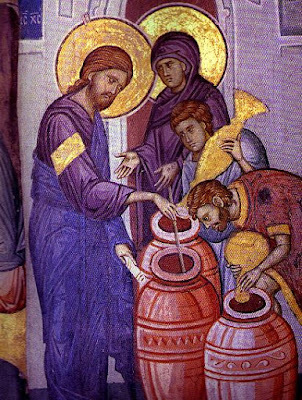 So the contrast of jars of water with jars of wine is the contrast between Moses and Jesus, between the Old Covenant and the New: “the Law was given through Moses, but grace and truth came through Jesus Christ” (John 1:17). But we can’t exposit all the symbolism present. Being selective, let’s note the most obvious: Jesus reveals himself here as the “ultimate Bridegroom.” The responsibility of the bridegroom at these ancient weddings was to provide the wine. We can see that in the text, because when the MC tastes the wine, he immediately calls the bridegroom, assuming that he was the one who procured the vintage. By taking on the bridegroom’s responsibility to provide wine, and doing so in a spectacular style (120-180 gallons of fine French import! ), Jesus reveals himself as the Bridegroom, one with whom no other mere mortal can compete. He is the Bridegroom who is both the LORD and the Son of David simultaneously, fulfilling the subtle nuances of the prophecies of Isaiah and of the other prophets who spoke of the renewal of God’s nuptial love for Israel in the future. In our First Reading, the prophet said to ancient Jerusalem, “you shall be called by a new name.” This “new name” is the Church. In keeping with the teaching of the Apostles, the early Christian community understood that a kind of transformation had taken place in the people of God: a national, ethnic, and geographical community had become international, spiritual, and trans-spatial: the “heavenly Jerusalem” (see Heb12:22-24; Rev 3:12; 21:2,10). Yet the two communities were joined as truly one, anchored by the core of believers who belonged to both covenant eras, most notably Christ Himself, with his Holy Mother, the Apostles, John the Baptist and hundreds of thousands of other baptized believers from the ethnic people of Israel (the 144,000 from the twelve tribes, Rev 7:4). So in the Wedding at Cana, Jesus reveals himself as the Bridegroom of the Church, our own spiritual spouse. Baptism is the nuptial bath, the Eucharist is the Wedding Feast, where we receive the Body of our Bridegroom and unite his body with ours. Our faith is one of intense intimacy. God loves us like a bride. He “rejoices” in us, takes delight in us, each one of us individually. In my days as a Protestant pastor, I encouraged people to have a “personal relationship with Jesus,” which indeed is, properly nuanced, the goal of our existence. But nothing is more personal or intimate than communing with Jesus in his very Body and Blood in the Eucharist. Some persons who have left the Church for other Christian groups have told me they “found Jesus” in another fellowship, and I have asked in return, “What did you think was going on all those years when you were coming forward at communion to take the Body of Christ?” I don’t usually get an answer to that question. However, I know the spiritual situation for them was probably not simple. There may have been grave catechetical deficiencies at their parish, perhaps compounded by poor example from other parishioners or even the clergy. Honestly, too, these persons may not have taken much responsibility to learn their faith or take advantage of the opportunities for growth that were available. Despite our failures in the past, in the Readings for this Sunday’s Mass, the Church proclaims anew the best news possible: God loves us, God reveals Himself in Jesus Christ, who comes to us “dressed as a Bridegroom,” with all the intensity of love and desire to enter into a relationship of intimacy with each one of us. The highpoint of this relationship is to receive Jesus in the Eucharist, the “source and summit” of our life. But on a practical level, our reception of Jesus in the Eucharist cannot be the only aspect of our “spousal” relationship, any more than a once-a-week embrace would suffice to make a marriage work. The reception of Jesus our Bridegroom in the Eucharist should be part of a lifestyle characterized by daily conversation with him through prayer and the reading of His word. So, while it is still near the beginning of the year, let’s make some “new liturgical year resolutions” before it’s too late. Let’s resolve this Sunday to make a new effort to set aside time—at least a half hour a day—to listen to Jesus in his Word through reading Scripture, and to speak to him freely in our heart (what the tradition calls “mental prayer.”) Meditating on Scripture and mental prayer make up the daily conversation of the believer with his or her Spouse, the Bridegroom Jesus. Let’s resolve to deepen that Spousal relationship with Our Lord this year not only on Sunday but every day of the week!